Welcome to my reference library. Here, you'll find books, articles, and links to online content that I’ve mentioned in blog posts that may be helpful to you with beginning your educational administration + leadership research, or taking a deep dive into an area of interest. The references listed below are sources that I’ve found to be helpful, but don’t forget to check out your university or local library for new publications and research! Samier, E.A. (2008). On the kitschification of educational administration: An aesthetic critique of theory and practice in the field. International Studies in Educational Administration, 36(3), 3-18. Samier, E.A., Bates, R.J., & Stanley, A. (2012). Aesthetic dimensions of educational administration and leadership. London, UK: Routledge. Sloane, J.A. (2013). Photographing vampires: The aesthetic absence in educational administration. Journal of Educational Administration and Foundations, 23(1), 73-85. Bozeman, B. (2012). The problem of beauty contest scholarship in public administration––and a possible alternative. Administration & Society, 44(8), 1019-1026. Lagoze, C., Edwards, P., Sandvig, C., & Plantin, J. (2015). Should I stay or should I go? Alternative infrastructures in scholarly publishing. International Journal of Communication, 9, 1052-1071. Marshall, P.D. (2015). Understanding the emerging contemporary public intellectual: Online academia persona and The Conversation. Media International Australia, 156, 123-132. Rowe, D., & Brass, K. (2008). The uses of academic knowledge: The university in the media. Media, Culture & Society, 30(5), 677-698. Stein, A., & Daniels, J. (2017). Going public: A guide for social scientists. Chicago, IL: Chicago University Press. Wolfgang, D., & Jenkins, J. (2015). Diverse discourse: Analyzing the potential of public affairs magazine online forums to reflect qualities of the public sphere. Journal of Public Deliberation, 11(1), 1-26. University Affairs Magazine - From the Administrator's Chair column. Curren, R. (2008). Cardinal virtues of academic administration. Theory and Research in Education, 6(3), 337-363. Blackmore, J. (2006). Social justice and the study and practice of leadership in education: A feminist history. Journal of Educational Administration and History, 38(2), 185-200. Mertz, N.T. (2009). 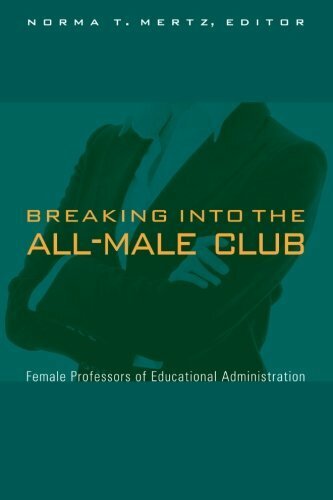 Breaking into the all-male club: Female professors of educational administration. SUNY Press. Bates, R.J. (1982). Toward a critical practice of educational administration. Commonwealth Council for Educational Administration, 27, 1-12. Callahan, R.E. (1962). Education and the cult of efficiency. Chicago, IL: University of Chicago Press. Greenfield, T.B. (1979). Organization theory as ideology. Curriculum Inquiry, 9(2), 97-112. Hallinger, P., & Heck, R.H. (2005). The study of educational leadership and management: Where does the field stand today? Educational Management Administration & Leadership, 33(2), 229-244. Kochan, F.K. (2002). Hope and possibility: Advancing an argument for a Habermasian perspective in educational administration. Studies in Philosophy and Education, 21(2), 137-155. Willower, D.L., & Uline, C.L. (2001). The alleged demise of science: A critical inquest. Journal of Educational Administration, 39(5), 455-471. Willower, D.J. (1994). Dewey's Theory of Inquiry and Reflective Administration. Journal of Educational Administration, 32(1), 5-22. Grimmelikhuijsen, S., Jilke, S., Olsen, A.L., & Tummers, L. (2016). Behavioral public administration: Combining insights from public administration and psychology. Public Administration Review, 77(1), 45-56. Hood, C. (1974). Administrative diseases: Some type of dysfunctionality in administration. Public Administration, 52(4), 439-454. Berg, B.L., & Lune, H. (2012). Qualitative research methods for the social sciences (8th ed.). Upper Saddle River, NJ: Pearson Education Inc.
Creswell, J.W. (2014). A concise introduction to mixed methods research. London, UK: SAGE Publications Ltd.
Bamford, V. (2014). Open or closed? An assessment of how blogs can contribute to policy-making. Media International Australia, 151, 16-24. Calabrese, R.L. (2011). Web 2.0 integration into the graduate classroom: An appreciative inquiry into prospective school administrator strengths and leadership experiences. International Journal of Educational Management, 26(2), 192-204. Calabrese, R.L., Roberts, B.E., McLeod, S., Niles, R., Christopherson, K., Singh, P., & Berry, M. (2008). Emerging technologies in global communication: Using appreciative inquiry to improve the preparation of school administrators. International Journal of Educational Management, 22(7), 696-709. Cho, V. (2016). Administrators' professional learning via Twitter: The dissonance between beliefs and actions. Journal of Educational Administration, 54(3), 340-356. Endres, W. (2006). Communicative strategies for administrative practices: Evaluating weblogs, their benefits, and uses. Journal of the Council of Writing Program Administrators, 29(3), 85-106. Friend, J., & Militello, M. (2015). Lights, camera, action: Advancing learning, research, and program evaluation through video production in educational leadership preparation. Journal of Research on Leadership Education, 10(2), 81-103. Kernaghan, K. (2014). The rights and wrongs of robotics: Ethics and robots in public organizations. Canadian Public Administration/ Administration Publique du Canada, 57(4), 485-506. Kimmons, R., & Veletsianos, G. (2016). Education scholars' evolving uses of twitter as a conference backchannel and social commentary platform. British Journal of Educational Technology, 47(3), 445-464. McNutt, K. (2014). Public engagement in the Web 2.0 era: Social collaborative technologies in a public sector context. Canadian Public Administration/ Administration Publique du Canada, 57(1), 49-70. Perez, L.G.,& Uline, C.L. (2003). Administrative problem solving in the information age: Creating technological capacity. Journal of Educational Administration, 41(2), 143-157. Shah, N.A.K., Shabgahi, S.L., & Cox, A.M. (2016). Uses and risks of microblogging in organisational and educational settings. British Journal of Educational Technology, 47(6), 1168-1182. Sherman, W.H., & Beaty, D.M. (2007). The use of distance technology in educational leadership preparation programs. Journal of Educational Administration, 45(5), 605-620. University Council for Educational Administration (UCEA) Film Festival website.